Finding the right pair of chef pants can be tough. After all, you need those pants to perform under a lot of pressure while keeping your chef cool. 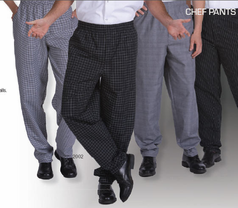 So where can you find a pair of chef pants to complete your chef uniform without sacrificing quality? At SharperUniforms.com, of course! At SharperUniforms.com, we carry chef pants made from yarn dyed fabric that are designed to be long-lasting, cool, and comfortable. In baggy, cargo, and utility styles, our chef pants come ready to meet the needs of any chef or kitchen. No matter what style of cuisine you’re preparing or the volume of service you need to handle, we know that our chef uniforms can help stand up to the challenge while keeping you looking and feeling your best on the job. Outfit your chefs with chef pants and chef uniforms that can stay cool when things heat up in the kitchen.